A Git commit cannot be changed, the sha for the commit will replaced at all changes. 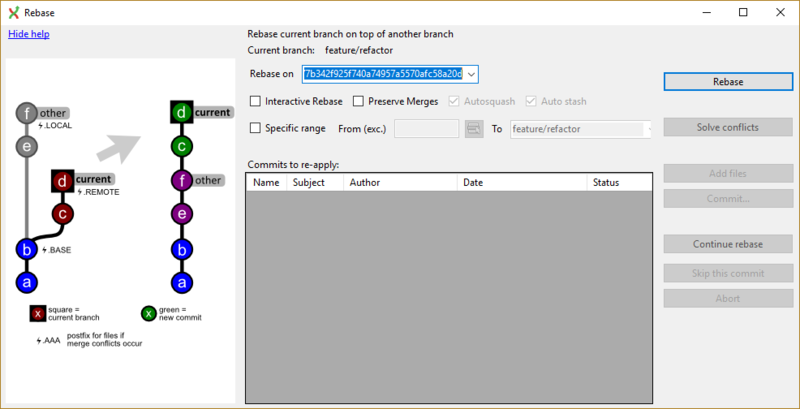 However, the contents of a commit can be modified and committed again as a new commit with a new sha and the branch/tag can be moved to the modified (new) commit. A commit can be reverted, the changes of a certain commit can be reverted and added as a new commit. 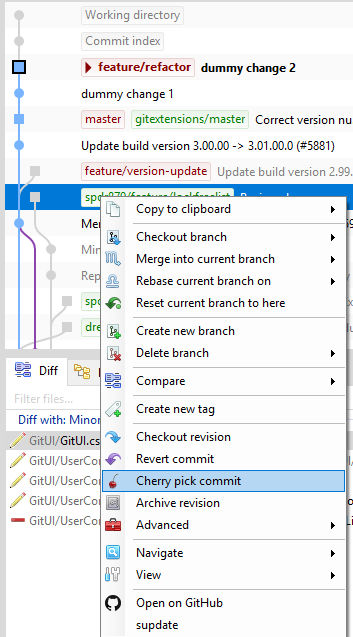 Similar, a commit can be applied again (possibly to a new branch), known as cherry picking. The commit can be added again (and all commits that are children to the commit) as new commits and git branches can be made to point to the new commit instead. As git only creates immutable commits (sealed by the sha1), “modifying” a commit is in fact creating a new more or less similar commit. Consequently, the entire history of children following the changed commit will be different. So, except if the history has not been already pushed, or if you have good reasons, it is a bad practice to change the history because you will mess the history of other developers. A commit cannot be deleted once it is published. If you need to undo the changes made in a commit, you need to create a new commit that undoes the changes. This is called a revert commit. A revert commit is similar to a cherry pick, but the cherry pick tries to apply the same changes as the original commit, a revert will try to reverse the changes. The easiest way to modify the last commit is to do an amend commit. 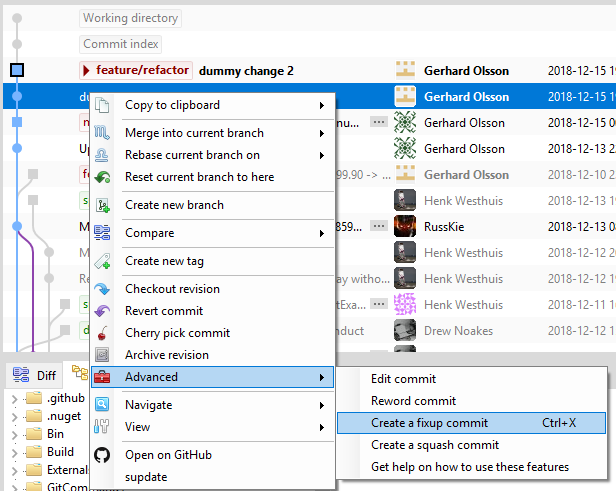 To do that, open the commit windows and check the option “Amend commit”. If the commit message text area was empty, it is now filled with the message of the last commit. 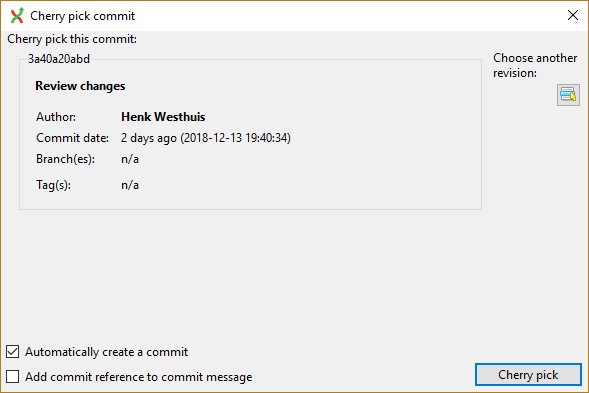 You could now just update the commit message and commit or also add some more changes in the staging area to add them to the commit. It normally makes sense just to change the history for the current branch. To change the parents of the current branch you will have to make a rebase. Git Extensions has functionality that wraps the Git rebase commands and simplifies usage in some situations. First, you should create a commit containing the changes you want to add to a previous commit (or know an existing commit that contains this changes). Then use the rebase feature in interactive mode on a base commit older than the one that you want to modify. 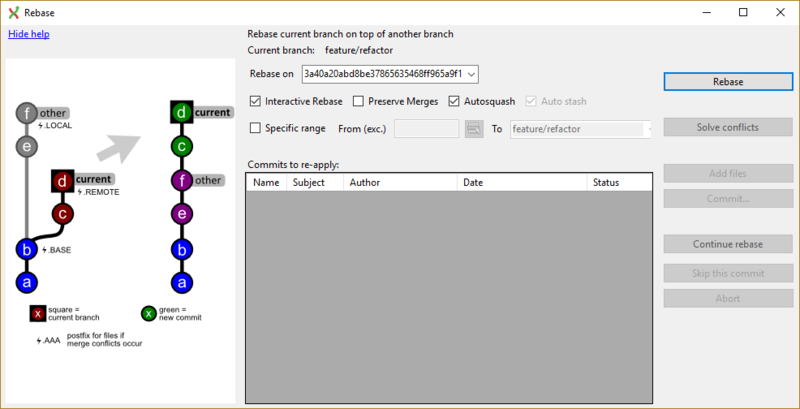 See Branches for how to start a rebase, start an interactive rebase from the context menu or by selecting the checkbox in the rebase dialog. You could have a look to this _documentation: https://git-scm.com/book/en/v2/Git-Tools-Rewriting-History to better understand all the possibilities offered. write s or squash in front of a commit to meld the commit with the previous commit and with rewriting the commit message. Often, we will use interactive rebase to move the line and squash or fixup commits to modify the history. 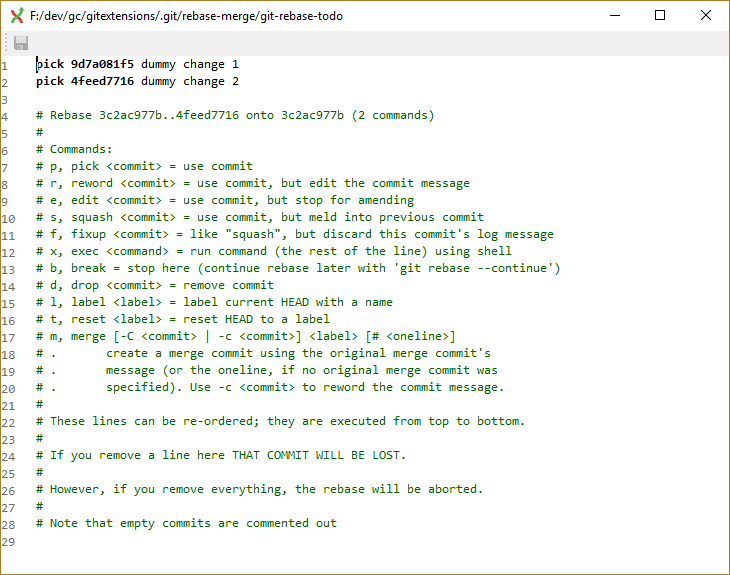 Once we did the changes, save and close the editor to let git do the rebase. There is an option to facilitate the use of the interactive rebase when you know, at the moment of doing a commit that the changes introduced by this commit should have been made in an older commit (the case of a fixup or squash ). 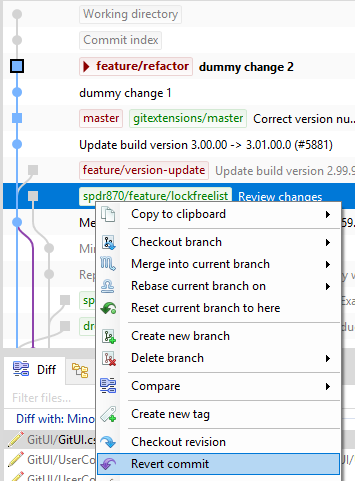 Right click on the commit in the history, you know that you want to “modify”. If you have not the changes prior to open the dialog, do them now. 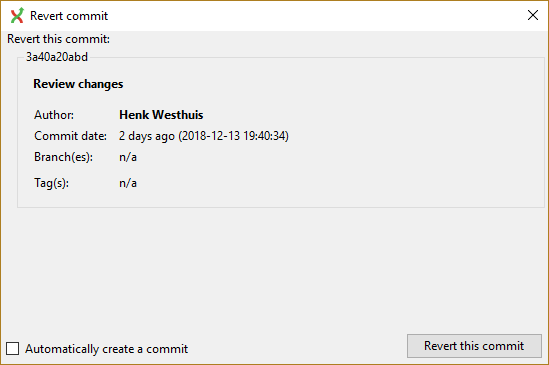 GitExtensions will open the commit window with an already filled commit message containing the needed information to find the commit to “modify”. Do not change the commit message and commit all the changes needed. Then process to the interactive rebase, like describe in the previous paragraph but with enabling the option Autosquash . Launch the rebase by clicking on Rebase . The interactive rebase will process the same way but with a major difference! When enabling the Autosquash option, git will automatically reorder the commits lines and write the good actions in front of the commits when it will open the text editor. You normally have just to close the editor (except if you want to do additional changes). And let git do the rebase. These options are the same as starting an interactive rebase on the parent to the selected commit and doing an edit (allow to amend to the commit) or reword (editing the commit message) and then run an interactive rebase in the background. Note especially that this functionality will fail if you try to edit/reword a commit that is not a parent to the current checkout.